Impact wrench from Craftsman Tools made by Ingersoll Rand for Craftsman. Until recently, I hadn't had an impact wrench in my tool box since I was in my '20s, working in the automotive service trade. Once I left the trades and began to work on race cars and other project vehicles, there was no need to be in a hurry to beat the flat rate and I sort of developed this somewhat elitist attitude that really good mechanics were much more careful and, thus, were above using those brutish, noisy impact guns. That was my thinking for many years, but in the last 12 months or so I've run across several jobs that had me rethinking the impact wrench issue. The first was replacement of the rear axle pinion seal on my '01 Camaro. I don't know how tight the pinion nut is because it's tightened until you achieve a specific pinion bearing preload measured by rotating the pinion with an inch-pound torque wrench, but the nut is takes a 1 1/4" socket and the GM J-tool needed to loosen it is a four-foot spanner wrench. That nut's gotta be majorly tight. The next job on the list after that was to get the heads off my 1971 Big-Block Coupe with the engine in the car. These heads have been on the motor for 15 years and were installed with ARP Head Bolts Pro Series bolts which are tightened to higher torque than stock bolts. I'm not in my 20s any more. I was tired of fasteners which are really hard to break loose. I'm tired of being an elitist, no-impact-gun kind of guy. My solution...go down to Sears and get a Craftsman impact gun. I selected one of the 1/2-inch drive, air, impact wrenches in the "Craftsman Professional" line, the model 199050, which is made for Craftsman by Ingersoll Rand, the renowned power tool maker. This tool generates 1250 impacts per minute and is capable of 400-500 ft/lb torque running forward and 500 ft/lb in reverse . 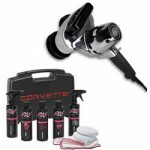 It's designed for a maximum air pressure of 90-psi. A great feature of the Craftsman 199050 is that it's the lightest of all the company's 1/2-drive units at 4.5 lbs. because its housing is a composite material. Its hammer case and all the rotating and reciprocating parts are metallic. I got my new impact back to the garage, installed a 1/4 NPT air fitting in the grip, squirted a few drops of Red Line Synthetic Air Tool oil in the air intake, connected the air line and pulled the trigger. Wow...the loud squeal of an impact gun, free-running at 9500 rpm brought back memories of my days in the service trade. My first job with this new toy was that rear axle pinion seal. I marked the pinion threads, the nut and the pinion yoke. I snapped a Craftsman, 1/2-drive, 1 1/4-in. socket on the gun--you have to use a non-impact, thin wall, conventional (chrome finish), six-point socket for this because the thick wall impact sockets won't fit on the nut due to the closeness of the surrounding structure of the pinion yoke. I pulled the 199050's trigger and zz-rrrr-ip. That nut was off. Hey, I'm liking this impact stuff. A month or so later, I had the Big-Block in my '71 torn down to the point that I was ready to lift the cylinder heads. Since the bolts are ARPs with 12-point heads and Craftsman does not market 12-point impact sockets, I rang-up my Matco Tools guy and ordered a 1/2-inch, 1/2-drive, 12-point impact socket. When it arrived, using it along with using either a short- or medium-length Craftsman impact extension bar, I zipped those head bolts out in no time. The only bolts that are a little tough are the two rear bolts on the left head. Because of the proximity of the brake booster, you have to get the right combination of the socket, a 1/2-drive impact universal and an extension. Once you have that, the Craftsman 199050 spins those two out easily. Getting the bolts out may have been easy, but now, I had to lean over and lift those cast iron heads off the motor. Ugh! I've been using the Craftsman impact for about two months. I like its lightweight compared to the impacts I used back in my days in the service trade but, I wish it was even lighter. Next, I like the ease with which the forward or reverse buttons on the back of the tool can be selected by simply pushing with your thumb. The large, power select dial is a neat feature for those who use mechanic's gloves when working on cars. For serious DIY work or light-to-medium, service trade use, the Craftsman Professional model 199050 Impact Wrench seems a pretty darn good value and it works quite well. It available at your Sears store or at www.craftsman.com and its fully-guaranteed for two years. 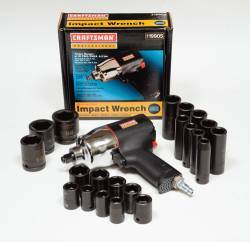 The Craftsman Impact Wrench, along with a selection of Craftsman impact sockets. That type of socket is advised in almost all occasions when the impact gun is used because they are made of a harder grade of steel and, thus, have better durability when driven by an impact tool. Image: Author. Be it a Camaro rear axle or a Corvette differential assembly, an impact wrench makes removal of the pinion nut much easier. Image: Author.